This small book, writtern by Dr. Sudarshan Sharma, is not merely a life story of ‘another Saintly person’ or a divine soul, but it provides a sense of direction to those wise men of the world who are keenly interested in uniting the mankind; fighting in the name of religion, caste, creed or colour. Religion does not consist of only the ritualaism or customs prevailing in a society; it is much more than this. A true religious man, who dives deep into his own religious scriptures; realizes the omnipotent power of the Lord prevailing all over. He realizes that other religious books also contain eh message of his beloved Lord though given to different people at different times under different circumstances. He starts loving and respecting them all as if they were his own. Thus dawn the realization of Oneness of Lord. When we realise unity in diversity; then only can we feel the same spirituality in every human being. This inner love and understanding for others, is the only way to world peace and unity. This book gives us the gist, preachings and evolution of the ‘World Religion’ as a whole. 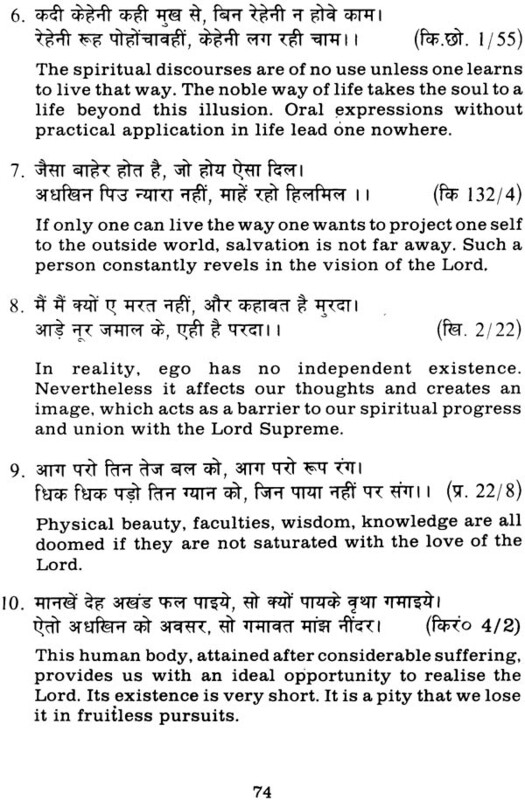 Mahamati preched this message of love for human beings about 300 years ago and laid down the base for One World Religion which he projected exhaustively in his Kulzam Swarup. His basic message to humanity was to follow their own religion in a true sense and respect the religious scriptures of others in a similar manner. We are not quite sure if we are able to project Mahamati’s view point properly in this short treatise. This is certainly not a substitute for the Master’s own Kulzam Swarup which we commend to our readers. If this booklet helps to raise the curiosity in their mind to delve deep further in the philosophy of Shri Prannath, we would have considered our effort to be worth while. India is a secular state. All religions are treated alike here. A Muslim is free to follow his religion as a Hindu or a Christian. The first great soul to dream of such a secular state was Shri Mehraj Thakur, Popularly known' as Mahamati Prannath (1618-1694). He devoted his life to the preaching of universal brother-hood, toleration and religious unity. Today over two million Pranamis, his dedicated followers, practise his teachings and carry his inspiring message far and wide. Mahamati was the pioneer of what later came to be known as 'Comparative Religion'. He was well versed in Vedas as in Koran and Bible. 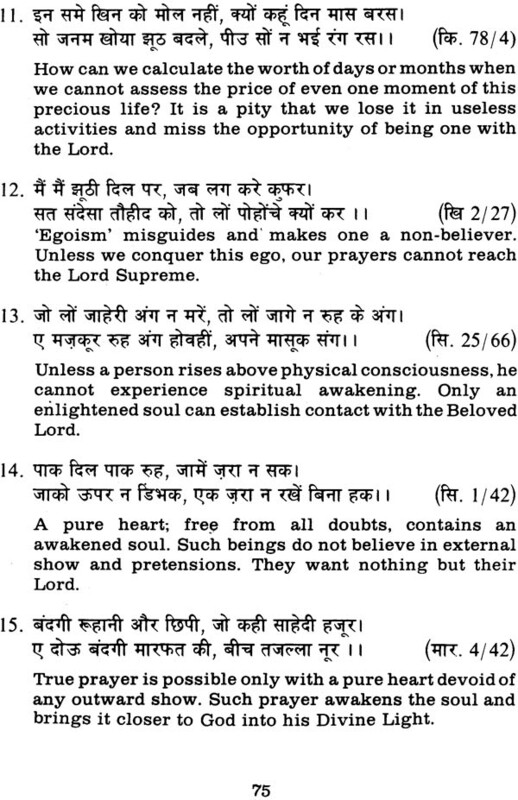 His deep knowledge of the scriptures convinced him that basically all the religions aim at realisation of the soul. Mahamati therefore, suggested a middle-path, a synthesis of all religions. He advocated Vishwa Dharma (World Religion) and Vishwa Samaj (World Commune) for the welfare of community at large. Over 18,000 verses of Kulzam Swarup, the soul- stirring treatise on religion, permeates with essence of all the best in all religions. Inspite of all difficulties to commute, he travelled throughout India and also to Arbian Countries to propogate this message. Sri Prannath was the first great humanist who put human interests above self. The Pranamis greet one another with the salutation 'Pranam' (obeisance), thus acknowledging the divinity in each human being. For Swamiji, Paramdham (the Supreme Abode, heaven) is the original abode of Atma (Soul). He considers it as his sacred duty to remind the wayward, confused and lost souls of their celestial abode, the seat of God who is 'Sachchidanand,' (Supreme truth, Consciousness and Bliss). 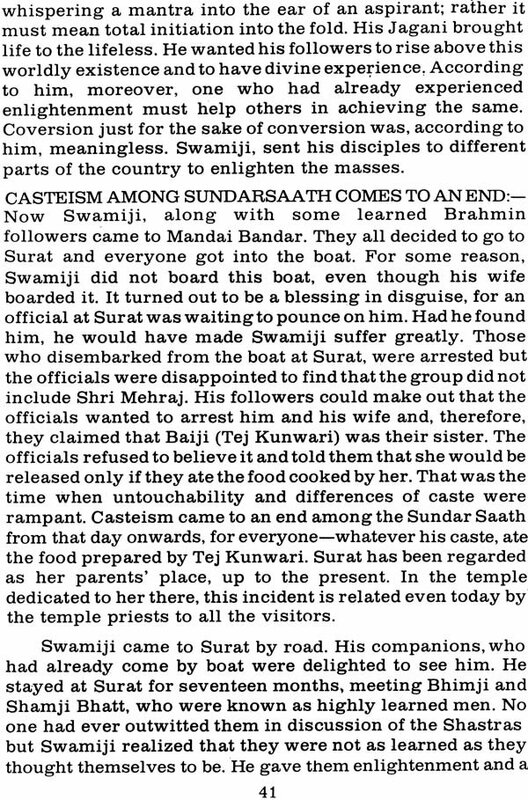 Swamiji did not approve of sham rituals and fanatic dogmatism perpetrated in the name of religion. 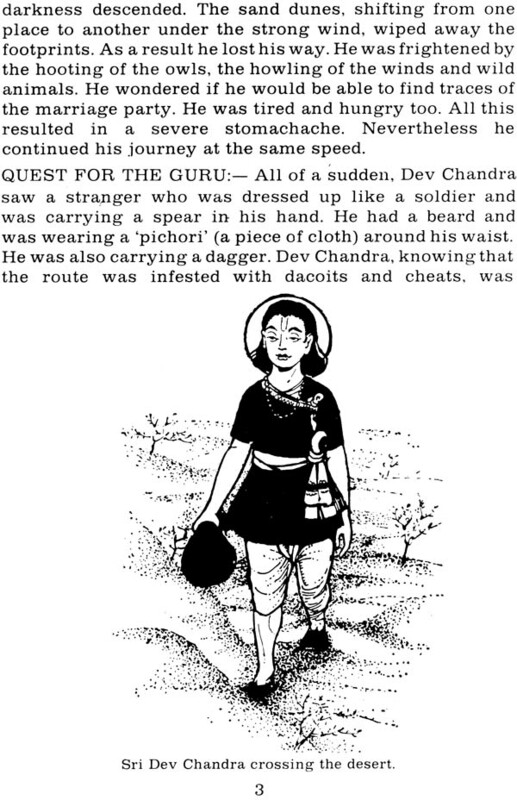 He spared neither the Brahmins nor the Mullahs for misguiding the innocuous people. Religion for him envisaged no discrimination on grounds of caste creed or colour Whenever he preached, he had a disciple on either side with the Vedas (Vedas, Puranas, Bhagwat etc). and 'Kateb (Zamboor, To ret, Anjeel, Koran etc). Swamiji was the first to moot the idea of comradeship. All his disciples were 'Sathis' (Sundersaath-Comrades). Sri Prannath traced the root cause of Hindu-Muslim dissension to the ignorance of true interpretation of their religion. He attributed this discord primarily to the shallow knowledge of inadequately educated Brahmins and Mullahs. He pointed out that both the Vedas and Kateb enjoin the worship of the same Lord and that it is the pseudo-adherents alone who create petty squabbles and quarrels. Both the Koran and the Gita refer to the same Supreme reality (Aksharatit Paramatma, Noor-i-jama.I) who is beyond the perishable (Kshara:la) and the Imperishable (Akshara:Noor-i-Jalal). Both maintain that there is the Absolute that transcends both the Ephemeral and perennial and that alone deserves to be adored. 'La illaha-ill-Illah' means. "There is no God but Allah". Here 'La' means nothing i.e. 'Kshara', 'Illah' means 'God' i.e. 'Akshara' and 'ill-Illah' means, the supreme i.e. 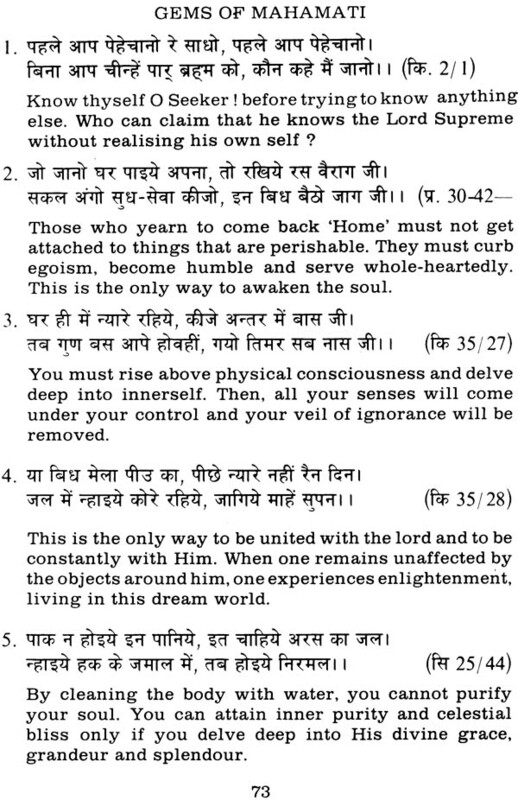 Aksharatit- Uttam Purusha of the Gita. Mahamati Prannath drew a parallel between the Hemitic and the Semitic concepts. He found singular similarity in their myths and mythologies. For him 'the Vedic 'Brahm is synonymous with 'Khuda'. 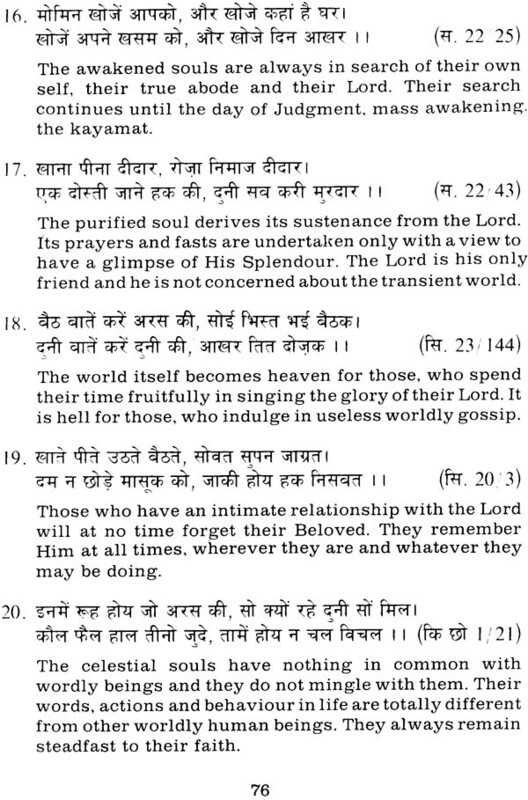 The three kinds of soul-Brahm Srishti, Ishvariya Srishti and Jiva Srishti-echo the Kateb enunciation of souls (Ummat) i.e. people of spirit (Haq-ul-akin), people of water (Immer-ul- akin) and people of clay (en-ul-akin). The concept of Seven spheres (Lokas) below the transient world (Martyaloka or Nasut) is also common in both the traditions. Vaikunth, Aksharadham and Paramdham are Malkoot, Jabroot and Lahoot respectively. Vishnu, Brahma and Rudra are described as Azazil, Machail and Israfel, in the same order. With a view to establishing lasting peace and amity, Maharnati tried to show close relationship between the Semitic and Hemitic religions. Shy am (Lord Krishna) is the 'Sham' of the semitic mythology. Like Vasudeva, Noah was also imprisoned for 40years and his children were killed till the last child was divinely advised to be taken to a far place. Noah's ark is compared to Goverdhan Lila. The entire human race owes its existence to Noah's sons Sham and Ham in the form of semitic and hemitic races respectively. As per Mahamati, Sham is .8hyam and Ham, Haldhar (Baldeo). After Raslila Sham went to the west and Ham, to the east. The Hindus (the Aryans), thus, are the descendants of Ham. Like common religion, Swamiji advocated common platform of suitable language. He was the first protagonist of a common script, Nagari for Indian languages. Though his preachings are in all the major languages of the times, i.e. Hindustani, Urdu, Gujarati, Sindhi and Arabic, interestingly the script is Devanagri. This was, indeed, the first known step towards the movement for a common link language. Following his foot-steps, Mahatma Gandhi also preached similar thoughts in his prayer meetings. 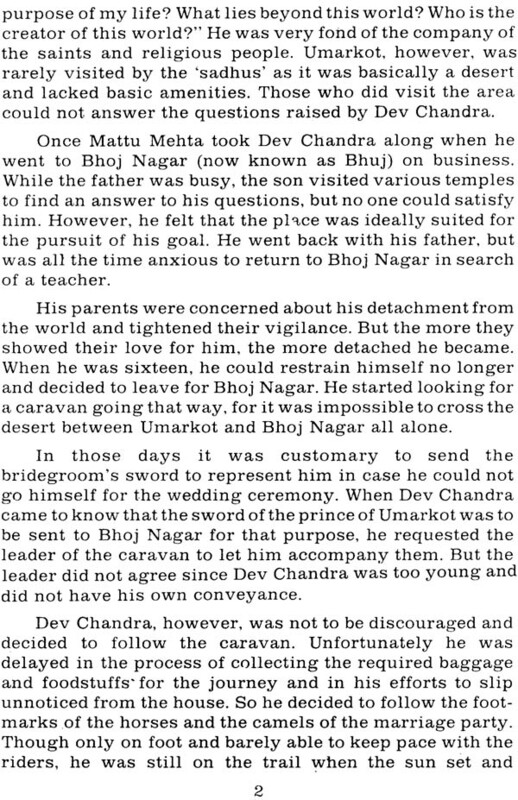 He has mentioned in his diary published by Pt. Pyare Lal that he was greatly influenced by his mother who was a follower of 'Pranami' religion. I am grateful to Sri Prannath Mission, especially Smt. 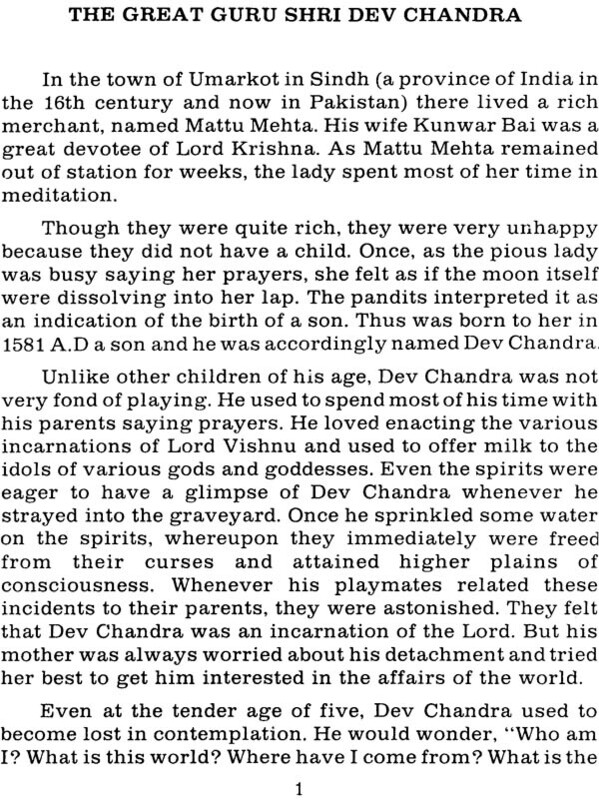 Vimla Mehta whose biography of Mahamati Prannath is the base for the present study. I am also obliged to Dr. L. Stafford Betty, Professor of Hindu Philosophy, California State University Bakersfield, for his valuable suggestions, help and guidance.